Astronomy.SG Newsletter for December 2009 is here! Welcome again to our monthly newsletter on Astronomy happenings in Singapore, which features the month's events, news, tips and tricks, promotions, and reviews. We hope you enjoy it! 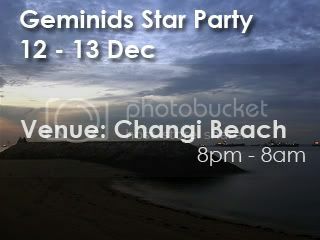 Catch the Geminids Meteor Shower together with other Astronomy enthusiasts! A trip to Pulau Semakau for the best skies far away from the city, but sadly no more tickets are available. An annual trip organised by NUS Astronomical Society, but registration is closed. Acronym for the School Outreach Astronomy Programs (SOAP), I think it's quite self-explanatory. Part of a series of monthly trips to Punggai for its great skies. The last one of the year, but no worries, there are more planned for next year. The usual monthly stargazing at Marine Parade. A rather unique and interesting way to bring IYA2009 to closure. Some awards will be given out as well. A countdown party by AGCC, but we're lacking information. Quite possible the most reliable meteor shower in Singapore, Geminids has returned without last year's full moon. Last month, we encountered a serious downtime that affected thousands of visitors for over a week. We offer you our apologies and explanation. The International Year of Astronomy 2009 approaches its final month. Let's look back at the events that marked the year. This is something like Astro Bargains' Bargains, if you get what I mean. The attack was targeting the IP address of the server, and not our website in particular, so this shouldn�t happen again in the near future. The downtime has affected the thousands of visitors reaching our website everyday, stemming from popularity of the Leonids Meteor Shower. Looking back, we can see that Singapore�s astronomy scene is not dull at all. Organised, coordinated, and/or supported by a wide range of individuals, groups and organisations, these events have served to popularise astronomy on top of the innate enjoyment and enrichment one gets from �doing� astronomy. Our tally of events for the whole year is as follows: 14 camps & overseas trips, 7 competitions, 25 talks, 86 star-gazings and 4 celestial events/others. The numbers are actually a rough gauge, as some events overlap two or more categories. For the sake of not over-counting we categorise each event according to its primary purpose. For example, all the 14 camps & overseas trips actually include star-gazing, but we have classified them as �camps & overseas trips�. To sum up, there are a lot of activities indeed. Numbers aside, we would like to recognise the following people and organisations for having organised all the events listed on http://astronomy.sg. They are in no particular order (okay actually there is � have fun guessing!). The list is, of course, non-exhaustive, and we hope we have not missed out too many groups and people. We know, too, of many unsung heroes who have worked tirelessly behind the scenes and behind their organisation�s name. We would like to thank them for their efforts, without which, I dare say, many events would not have come about, much less envisioned at all. We hope that http://astronomy.sg has enabled more people to know more about Singapore� astronomy scene, thus fulfilling its primary purpose. Not just looking forward, by seeing what new events there are, but also looking back, for http://astronomy.sg is also an archive of events. Catch Geminids Meteor Shower a day before its peak! Planets can be seen � Jupiter, Mars, Saturn. MPASTRO is� giving away IYA-sponsored items and bottled water (while stocks last). Getting there: Changi Beach Park is served by SBS Transit bus services 9, 19 and 89 at several bus stops along its length. These bus stops are among the closest to the coast you can find in Singapore. By taking these buses, visitors can alight along Nicoll Drive. Visitors can also take bus services 2, 29, 59 and 109 to Changi Village and 5 minutes of walk across the pedestrian footbridge to the park. Activity Type: Suitable for age 12 and above. In case of rain � MP ASTRO will inform the participants 3 hours in advance if there are any changes to the schedule. The public star-gazing consists of a short tour with the aid of a laser to introduce the constellations you can see in the sky. To register, please send mpastrosociety@gmail.com an email with your name, NRIC no. and contact number. There will be an on-spot briefing on instructions and rules. In pairs � be the fastest to solve all the clues! Winning pair will receive a GV Movie Voucher each. Individual Round and must have a telescope � be the fastest to locate the list of objects! Winner will receive the book �Turn Left At Orion�. Winning pair will receive 2 free tickets each to Pulau Semakau on 19 December. To register for the games, please send mpastrosociety@gmail.com an email with your name, NRIC no. and contact number. 2. Remember to bring a red light if you plan on wandering around the site and arrive before dark so you can familiarise yourself with the site. A simple way to create one is to wrap red cellophane over the bulb/LED of the flashlight. 3. Children are more than welcome to attend but need to be supervised at all times, as there are a lot of potential trip hazards, and expensive equipment set up in the area. Note: tickets are all sold out. Come this December, NUSAS will organise a 3D2N trip to Bintan Island! This overseas stargazing trip to catch the Geminids Meteor Shower organised by NUSAS is available to all at a very affordable cheap price of $160 ($150 for members and ex-Astrobashers)! This year, we will be watching it during its peak, and with the new moon in place, the night sky will simply be spectacular! Signups have closed. For latest updates, please visit http://www.nusas.org/astrobash/. The class timing is from 7:30pm � 9:30pm except for class on 28 Nov.
Students who are in Primary 5, 6 and Seconday 1 to 5 are eligible to participate. Please send your enquiry to mpastrosociety@gmail.com. S.O.A.P is a non-profit Astronomy outreach programme organize by Marine Parade CC YEC Astronomical Society (MPASTRO), where workshops and weekly classes will be conducted for all secondary school students with a keen interest in Astronomy. The workshops and classes (can be conducted at individual participating secondary schools) consist of educational talks, interactive discussions and games, including a telescope viewing session where students will have a first-hand experience of looking through the telescope for sky observations, as well as learning how to operate a telescope. The workshops will be using problem-based learning (PBL) teaching and learning approach in order to improve students� learning experience in the subject of Astronomy rather then the traditional lecture-tutorial approach. PBL is a revolutionary and radical teaching approach. It is completely different from the traditional lecture-tutorial approach as there is a shift of power from the �expert teacher� to the �student learner�. S.O.A.P is an initiative by MPASTRO to enrich students in Astronomy and serves as a platform to broaden their exposure to various aspects of the field (in astronomy) ranging from geography to sciences like chemistry and physics. More importantly, we hopes to ignite in the students a life-long passion for Astronomy, and to maximize the potential of every individual by creating a culture of lifelong learning and to instil the ability in each learner the ability to reason. Registration for this month's trip is closed, but do have a look at the planned trips for next year. Listed below are the plans for trips to Punggai, Malaysia, in 2010 (subject to change). As they are generally held over weekends for convenience, do feel free to join in, especially on those where you may be able to catch a good view of a meteor shower! Generally, the group will depart on Friday night around 8pm, meeting at a set place. Depending on how many people sign up, transport may be in the form of 12-seater van or by coach. On the last day, the van will depart the chalet at 10 am. If you are interested, please email Carole at yenaw @ pacific . net . sg (without the spaces). The closing date is 1 month prior to the trip. This Christmas Appreciation Party is also to mark the end of the International Year of Astronomy 2009. To celebrate our local youth achievement in promoting Astronomy in Singapore. The winner will receive a star trophy and a Galileoscope! All results will be announced only during the party. The party will be held at Ubin Lodge, Pulau Ubin, on 24 Dec. It starts at noon, with overnight optional. Note: this event was formerly known as the IYA Thanksgiving Party. On New Year�s Eve, AGASTRO will be organising Jam It 2010 (Countdown) at the Woodlands Civic Centre. We don't have much information yet. Ticket sales will open soon, so check back on our site to find out more! MPASTRO aims to provide opportunities for the public to enjoy and learn about astronomy at the comfort of their neighbourhood (especially people in the east), as well as maximize night-sky observation experiences with their own next-door neighbours. The stargazing session will acheive that objective and it consists of a lecture and a telescope viewing session at the CC�s roof top. Registration begin from 7:15pm at the registration booth beside MPCC Office. For the latest updates, please refer to http://mpastro.blogspot.com/. Occurring every year in mid-December, the Geminid meteor shower is commonly referred to as the most reliable meteor shower of the year. That is, it almost always puts on a great show! The Geminid meteor shower has a very broad maximum peak. Because of this, the night on which you view the meteors isn�t critical. You will of course, see more meteors on the peak nights. This year the Geminid meteor shower�s peak is the night of December 13th-14th, 2009. The best time to view a meteor shower is in the late night to early morning hours. The best time to view a meteor shower typically begins around 2 AM. This is because as the Earth rotates toward dawn, the forward velocity of the planet adds to the linear velocity of the surface and atmosphere. This has the effect of �sweeping up� more meteors. If you�re not normally awake at 2 AM, like many people, simply go to sleep very early and set an alarm clock to wake you up to view the meteor shower. Trust me on this point, it is definitely worth it. The Geminid meteor shower�s radiant is right near the twin bright stars Castor and Pollux in Gemini. Click the image at top right to see a map (thanks to Stellarium). The trick, however, isn�t to look towards the radiant, but to keep your eyes on the whole sky. While it�s impossible to look at the whole sky, just keep your eyes scanning and alert. This increases your chances of seeing a fleeting meteor or one out of the corner of your eye. Darkness is key to proper meteor shower viewing. If you live in a city or other light polluted area, try going to a dark sky site to truly experience a meteor shower. You might be surprised how close a dark sky site is to you! Here are some tips on finding a dark sky near you. Keep comfortable, too! I�ve found the best way to watch meteor showers is either laying down in a sleeping bag, or on an Adirondack or other reclining lawn chair. This allows you to keep your eyes on the sky without straining your neck! Keep safe! If you�re traveling to an unknown or unfamiliar area to watch the meteor shower, don�t travel alone! Take a buddy with you. Not only is this great for safety, but meteor showers should be a social event, and are fun to share with a friend! Green lasers are great for pointing out celestial objects. I use one to point out objects to people, and it works much better than trying to point with your hand. Just be careful with it and do not use a laser more powerful than 5 mW. Finally, if you�re feeling ambitious, take pictures! This is a real challenge, but if you�re up to it, it�s a very rewarding challenge. You�ll need a tripod and a camera that can take long exposures. Set your exposure for somewhere around 30 seconds and let it record the whole sky. If a meteor crosses the field of view, it will be captured, and you can keep it forever! So using these tips, you can get the most out of your Geminid viewing experience! This complete spotting telescope kit includes an 80mm aperture refractor with a 500mm focal length. It includes 10mm and 25mm plossl eyepieces, a 5X24 erecting finderscope; 45� prism diagonal, moon filter, solar filter; a very stable camera tripod, and carrying cases. Order a 90� 1.25? 1/10th wave diagonal for astronomy use, at the bundle price of S$39 (regularly S$49). Wide-field optics, easy to use, the StarBlast EQ is an excellent starting set to see the stars, the Moon and more. It combines the much-heralded StarBlast wide-field (f/4.0) parabolic optics with a sturdy, adjustable-height EQ-1 equatorial tracking mount. This version of the StarBlast offers an even more pronounced wide-field viewing experience, with two Expanse series eyepieces � 15mm (30x) and 6mm (75x) � which have a 66� apparent field of view. Images of everything from the Moon to the Messier objects appear exceptionally sharp and contrasty. Wonderful for binocular astronomy as well as scenic daytime viewing. BAK-4 porro prisms and multi-coated objective lenses ensure bright, crisp images. Wide 7.1-degree field of view and 14 foot close focus. Sturdy metal (not plastic) housing with large center focusing mechanism. Includes carrying case, lens cap and deluxe wide neck strap. Disclaimer: Efforts have been made to ensure that all information is correct as at the time of publishing of the newsletter; however the author(s) of this newsletter bear no responsibility for the accuracy of the announcements. � 2009 Astronomy.SG | All Rights Reserved. The Geminid meteor shower has a very broad maximum peak. Because of this, the night on which you view the meteors isn't critical. You will of course, see more meteors on the peak nights. This year the Geminid meteor shower's peak is the night of December 13th-14th, 2009. The best time to view a meteor shower is in the late night to early morning hours. The best time to view a meteor shower typically begins around 2 AM. This is because as the Earth rotates toward dawn, the forward velocity of the planet adds to the linear velocity of the surface and atmosphere. This has the effect of "sweeping up" more meteors. If you're not normally awake at 2 AM, like many people, simply go to sleep very early and set an alarm clock to wake you up to view the meteor shower. Trust me on this point, it is definitely worth it. The Geminid meteor shower's radiant is right near the twin bright stars Castor and Pollux in Gemini. Click the image at top right to see a map (thanks to Stellarium). The trick, however, isn't to look towards the radiant, but to keep your eyes on the whole sky. While it's impossible to look at the whole sky, just keep your eyes scanning and alert. This increases your chances of seeing a fleeting meteor or one out of the corner of your eye. Keep comfortable, too! I've found the best way to watch meteor showers is either laying down in a sleeping bag, or on an Adirondack or other reclining lawn chair. This allows you to keep your eyes on the sky without straining your neck! Keep safe! If you're traveling to an unknown or unfamiliar area to watch the meteor shower, don't travel alone! Take a buddy with you. Not only is this great for safety, but meteor showers should be a social event, and are fun to share with a friend! Finally, if you're feeling ambitious, take pictures! This is a real challenge, but if you're up to it, it's a very rewarding challenge. You'll need a tripod and a camera that can take long exposures. Set your exposure for somewhere around 30 seconds and let it record the whole sky. If a meteor crosses the field of view, it will be captured, and you can keep it forever! Order a 90� 1.25" 1/10th wave diagonal for astronomy use, at the bundle price of S$39 (regularly S$49). To register for this event, please email to admiralgarden.astro@gmail.com. Astronomy.SG Newsletter for November 2009 is here! Catch the Leonids Meteor Shower from East Coast Park! 14-15 Nov. Yet another one, but at Japanese Gardens and Science Centre. 17 & 19 Nov.
A 50-minute live performance featuring images of Earth and Space by award-winning director and violinist, Kenji Williams. As if having 3 events isn't sufficient, we'll tell you more. Last month, three students represented Singapore at V APAO. How did they fare on the international stage? We are having a tie-up with local vendor Astro Bargains to bring you greater value for Astronomy products. Nomination for IYA Thanksgiving Party! Nominate your friends to receive various awards like Best Astronomer in this upcoming event in December! NOTE: This activity is for age 12 and above. 2. Things to bring � For individual, please bring your ground sheet. There will be nearby�7-eleven and McDonald open 24 hours.�A bottle of mineral water and colour�star chart will be provided. 3. Transportation � FREE. 2-way shuttle service will be provided from Woodlands CC to East Coast Park Area D and back to Woodlands CC the next morning. 4. Registration ��To register,�send us an email (admiralgarden.astro@gmail.com)�with your�NAME, NRIC, ADDRESS. As this is a overnight activity, participants who are�below 18 need to get their parents to sign the indemnity form. You can request the form via email. 5. Goodies � There will be free goodies (book marks, light sticks, etc) givento registered participants only. 6.�Weather�Permitting�� The stargazing activity is weather permitting. In case of bad weather, we will seek�shelter at McDonald. Do not worry if you are a beginner in stargazing, our astronomers will be happy to answer all your question(s). The Science Centre Singapore and TASOS are celebrating the International Year of Astronomy (IYA) 2009 with a big bang. The stars of the show are forecasted to be a meteor storm that will happen between 3am to 5am. Astronomers have predicted that the annual Leonids might put up the most dramatic light show not seen in recent years as the earth passes close to the centre of the comet�s debris trail laid down in 1466. The ideal locations for viewing are in Asia and North America. On stage, there will be performances by Kenji Williams, an audio visual art performer, while offstage, visitors will be entertained by the Science Buskers. For astronomy buffs, an accompanying meteorite exhibition, a talk by TASOS, on-site telescope viewing of the planet Jupiter and inflatable planetarium tours for children will also be held. Science Centre Singapore cordially invites you to Science in the Caf�. Bella Gaia (�Beautiful Earth�) is a �living atlas� journey of our world, expressing the deeply moving beauty of planet Earth as seen through the eyes of astronauts. Created by award winning director and classically trained violinist, Kenji Williams, Bella Gaia features a 50-minute live performance by Kenji against a large-screen backdrop of orbiting visualizations of Earth from space: from fires in the Amazon basin to time-lapse images of Arctic ice melts, the stunning orbital imagery � rendered by SCISS� Uniview using data from NASA, provides an exquisite simulation of the astronaut�s view from space. The performance also includes earthbound visitations from exotic Japanese temples to Egyptian pyramids, bringing a rich cultural dimension to the experience. Bella Gaia is a powerful entertainment and educational outreach vehicle for planetariums, science centres, universities, government agencies and other institutions that wish to convey a broader worldview that the destiny of humans and our planet Earth are inextricably linked. In this caf�, Kenji will perform an abbreviated version (~10 minutes) of his beautiful creation, Bella Gaia. The short performance will be followed by a discussion about the background of his inspiration on Bella Gaia, and examples of the variety of uses for Bella Gaia, including science education. Time- permitting, Kenji will discuss his creative processes in this fusion of science and art. Movie clips may also be included in this caf� (time- and resource-dependent). not less than 2 days before the caf�. Please refer to the attachment Bella Gaia for more information. You may also like to watch the trailer of Bella Gaia at http://www.youtube.com/watch?v=DiI7vMbSpn8. WHEN TO WATCH: The predicted outburst, perhaps with rates of 100-500 Leonids per hour, strongly favors Asian observers, who should watch on the morning of November 18. North American observers should especially try to cover the morning of Tuesday, November 17 in case of unusual activity leading up to this peak. The Moon will be completely out of the picture and will not cause any problems. Just keep radiant elevation in mind wherever you�re observing from. The radiant rises between 10pm and midnight for the bulk of the Northern Hemisphere. Leonid activity will be nonexistent before this time, and relatively very low for a couple of hours thereafter. Morning hours tend to produce the best rates, although the few earthgrazing Leonids seen around radiant-rise can be very impressive. The Leonids are very fast meteors. The shower is active at a low �background� level for about a week from November 14-21. Quite a few sporadic and minor-shower meteors join the cast, especially in the predawn hours. Astronomers from Caltech and NASA say a strong shower of Leonid meteors is coming in 2009. Their prediction follows an outburst on Nov. 17, 2008, that broke several years of �Leonid quiet� and heralds even more intense activity next November. Forecasters define a meteor storm as 1000 or more meteors per hour. That would make the 2009 Leonids �a half-storm,� says Jeremie Vaubaillon of Caltech, who successfully predicted a related outburst just a few weeks ago. From 7 Oct to 14 Oct 2009, three students from two schools participated in the 5th Asian-Pacific Astronomy Olympiad in Damyang, Korea. A whirlwind of events ensued. There were official excursions to the Sun-cheon Bay Area famous for its wildlife, the Korea Astronomy and Space Science Institute, a traditional Korean fortress, a bamboo park (Damyang is famous for bamboo), and many more. On their own, the participants organised games ranging from �Mafia� to �Capture the flag� to a hybrid of sepak takraw and volleyball, and even a �Disco Night� on the last night of the Olympiad. Okay � that was the fun part. The stressful part was obviously the competition. The problems set were of a rather high standard and of quite a different style as what we are used to seeing in Singapore. On top of that, the competition was quite intense. Indonesia, China, Thailand and Korea are known powerhouses; moreover, Korea was the host country. Nevertheless, the Singapore team managed to focus and gave their best throughout the competition. All received the III-rd Diploma, equivalent to a Bronze Medal. Congratulations to Stacey-Ann Lee, Silas Yeem and Tay Woon Kiat! No less valuable were the contributions of Seow Yongli as jury member; and Joel Lee as observer and chaperone. The Olympiad was not just a test of astronomy knowledge, but also an event where learning of different cultures and countries in addition to learning more about astronomy takes place. Yet more important that that, I feel, is that friendships were forged, and the totality of the Olympiad has inspired the participants to work harder for the betterment of the astronomy community. Note: For those who are interested in participating in future regional or international olympiads, whether as a student, team leader or observer, do feel free to email me at contact@astronomy.sg. Those who would like to contribute in other ways such as coaching are also welcome. Winner will receive a star trophy and a Galileoscope! Nominee�s Name, NRIC, Date of Birth, Address, Member of which astro club. Voter�s Name, NRIC, Member of which astro club. To nominate your club, please send an email to mpastrosociety@gmail.com to request for the nomination form. All results will be announced only during the party. Meade DSI Pro with RGB filters � S$339! The Deep Sky Imager PRO is 2.3 times more sensitive and has 4 times the resolution of the color Deep Sky Imager. It is a high-performance, easy-to-use monochrome CCD camera that allows every astronomer to shoot and process stunning deep sky photographs of galaxies, nebulae, star clusters and planets. This CCD camera is designed with the intermediate to advanced amateur astrophotographer in mind. Includes the high quality RGB filter set to� produce stunning RGB and LRGB images. The Galileoscope is a high-quality, low-cost telescope kit developed for the International Year of Astronomy 2009 by a team of leading astronomers, optical engineers, and science educators. No matter where you live, with this easy-to-assemble, 50-mm (2-inch) diameter, 25- to 50-power achromatic refractor, you can see the celestial wonders that Galileo Galilei first glimpsed 400 years ago and that still delight stargazers today. These include lunar craters and mountains, four moons circling Jupiter, the phases of Venus, Saturn�s rings, and countless stars invisible to the unaided eye. Bosma Omega MC 6? f/12 Rumak Mak Cass OTA � S$999! Very robustly built OTA with 150mm aperture and 1800mm focal length for detailed views of lunar and planetary objects. Weighing 7kg and 56cm in length, it includes the OTA, 7X50 Finderscope, 2?/1.25? compression ring eyepiece adapter, and an SCT adapter. Introductory pricing includes complimentary dewshield (a S$59 value). To purchase, please send an email to sales@astrobargains.com, or send a fax to +65-6462-5313, with the item you are interested in and your contact information. Astronomy.SG Newsletter for October 2009 is here! Well, last month's newsletter didn't make it for distribution. Oops. I'm sincerely sorry for that and I'll try to make sure it doesn't happen again. For this month, the activities kickstart with some interesting events over at Science Centre Singapore. There's the IYA2009 Mid-Autumn Nite on 2nd Oct (Friday), where you can bring your friends & family for a magical night out, basking in the warm glow of lanterns & discovering the enchanting night sky! It's free admission as well, and there are many activities such as a Lantern Walk (with free lanterns! ), stargazing at the Observatory, free mooncakes, 3D planeterium making, movie screenings and a couple other things. Definitely a very eventful night, so do check it out! More information over at http://astronomy.sg/archives/594. Also, supposedly, the prize presentation ceremony for the Moon Photo Competition (http://astronomy.sg/archives/336) is scheduled on the same day, 2nd Oct (Friday), but I don't have much information to verify that since I'm not a participant. But I guess there's no harm wishing all participants good luck for their entries! Once again, the Punggai Astronomy Trip (http://astronomy.sg/archives/599) is back! This time, the Orionids Meteor Shower is factored into the stargazing trip, which is an added bonus. The trip is from 23rd Oct to 25th Oct, Friday to Sunday, and will set you back S$130. Limited spaces available (about 20), so do hurry and sign up if you're interested. The closing date for registration is 15th Oct. Please contact Carole at yenaw@pacific.net.sg for more information or to register. MPASTRO is also organising Galilean Nights 2009 (http://astronomy.sg/archives/610), in conjunction with the IYA2009 cornerstone project of the same name. Also riding along the beauty of the Orionids Meteor Shower, this event will be held at Marina Barrage on 24th Oct 2009. It's an overnight activity, so hopefully that gives us a good opportunity to catch some Orionids meteors and fireballs after midnight. Not much information is out for now, so do keep a lookout for updates over here, or contact MPASTRO directly at mpastrosociety@gmail.com. There will be a star-gazing at Tiong Bahru Park on 24th Oct (Saturday), 7:30pm - 10pm. It's the SingAstro Sidewalk Astronomy which has been going on for some months, organised by very passionate individuals of the organisation. Do check it out! More information over at http://astronomy.sg/archives/595 and http://www.singastro.org/viewtopic.php?t=7576. I think that pretty much sums up the activities for this month! You may find additional events listed on the calendar over at the Astronomy.SG website, but we cannot confirm the status and validity of the events, so do find out more before attending them. Other than that, have a good month of Astronomy!